Gold rose for the first time in five days yesterday, closing at $1,767.1 and ending its worst run in more than two months. The market rose by around 0.4% as commodity CFD investors remain bullish about its long-term outlook in light of the Eurozone debt crisis and Spain's credit downgrade. This week, the precious metal has traded between the $1,756 and $1,795 levels, without any fresh catalysts to drive it from that range. US crude was firmly on the offensive yesterday, rising $0.80 to $92.07, as tensions continue to build between Syria and Turkey. Any conflict would be certain to disrupt supplies, particularly because Turkey is home to a number of key pipelines. If anything, the larger-than-expected rise in weekly crude inventories only managed to limit the advance rather than reverse the trend. Gold fell by more than 1% for the fourth day in a row yesterday, closing at $1,761.9 amid Eurozone worries that are boosting the dollar. Even though gold has lost some of its sparkle this week, its interest as a long-term safe haven remains intact. Many investors are confident that the precious metal will continue to perform in the face of short-term Eurozone problems. This morning, the gold market is attracting a few buyers, lifting it to $1,768. During the early part of yesterday's session, the Organization of Petroleum Exporting Countries said that oil supplies are currently at a comfortable level. As a result, they cut expected demand growth by 100,000 barrels and also mentioned uncertainties going forward. This convinced energy spread trading investors that it was time to sell, and the price of WTI crude oil finished $1.01 down at $91.25. The weekly US stockpiles report will be released later today due to the Columbus Day holiday on Monday. Gold prices declined for the third day in a row yesterday, dropping $12.55 to $1,763.30. 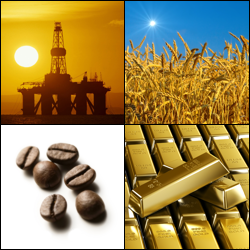 Commodity investors were put on the back foot by a bleak prediction from the International Monetary Fund regarding the global economic outlook. As is often the case, the dollar attracted the safe haven demand and its strength weighed on the precious metal. Yesterday, the energy market chose to ignore the IMF's warnings of ongoing downside risks for the global economy. Instead, the price of WTI crude oil posted a sharp rise of $2.77 to $92.39. It appears that the focus has shifted back onto troubles in the Middle East, with rising fears of an escalation in the conflict between Syria and Turkey. The gold market closed lower for a second consecutive day, slipping by just over $5 to settle at $1,775.3. Concerns over global growth and the Eurozone debt crisis could weigh on the precious metal as these worries normally help to maintain a stronger dollar. Whilst gold is currently on the defensive, the previous stimulus measures taken by the largest central banks still make it an attractive hedge against inflation. Physical demand has been kept low recently but, if the price continues to dip, the demand could perk up. Some commentators are even suggesting that the market will hit the $1,800 mark by the end of the year. A slightly stronger US dollar encouraged a down day for the crude oil markets yesterday, with the price of US crude falling $0.52 to $89.33 a barrel. The short-term trend remains bearish as, so far, the abundance of supplies has restricted any upward push. However, yesterday's headlines were made by the widening of the Brent - US crude differential which moved up towards the $23.00 level, close to a one year high. After signs of improvement in the US jobs market, investors started to unwind those long gold positions placed on a safe haven basis. This happened despite a slight weakening of the US dollar, which is usually an incentive to buy the precious metal. The gold spread trading market saw a $10 retracement, closing at $1,780, and this seems to be continuing this morning, with the precious metal trading at $1,769. Despite Friday's positive US Non-Farm Payrolls data, crude oil futures remained under pressure, losing $1.63 to $89.88. The perception is that crude oil supplies are still plentiful and that refinery problems are poised to reduce demand for oil in the short-term, with a shortage expected in the gasoline market. Could widespread tensions in the Middle East change the bearish mood or are energy investors slowly growing immune to such news? Gold increased by as much as 0.3% yesterday, touching a high of $1,795.3, the highest intraday level since November last year. The spreads market closed at $1,790.1, making it the fourth consecutive day of gains, as stimulus measures continue to make the precious metal an attractive hedge against inflation. Gold's recent strength has been helped by the ECB's decision to keep interest rates unchanged and its statement that it was prepared to buy the bonds of debt-laden nations. In addition, Japan aided the bulls' cause by boosting its gold reserves. The precious metal is approaching the $1,800 dollar level, which has not been hit since November last year, and it could well be an exciting day for gold as it edges higher. The price of Nymex crude oil rallied sharply yesterday, effectively recouping the losses posted the day before, largely on the back of a border conflict between Turkey and Syria. Furthermore, a fire reported at one of Exxon Mobil's refineries exacerbated the rise, with the market closing $3.70 higher at $91.71 a barrel. Today, all eyes will be on the US employment report which could offer a few extra clues on motorists' spare income and thus future oil demand. In a day that lacked any real volatility, the gold market managed to gain $4.50 and close at $1777.35. On the one hand, growing uncertainty regarding the global economic outlook, with even China showing signs of stuttering, is keeping the precious metal well supported. But on the other hand, the strength of the US dollar, which currently seems to be favoured as a better safe haven, is acting as a drag on prices. Defying an escalation of conflicts in the Middle East, the price of WTI crude oil posted a sharp sell off yesterday, losing $3.50 to $88.14. The move was triggered by signs that China's expansion is losing steam faster than previously anticipated. With Europe still mired in debt troubles and oil demand in the US struggling to keep up with an overall rising supply, energy investors seem to be losing patience. Gold has seen little change over the past three days, moving within a $2 trading range since Friday and closing at $1774.5 yesterday. The precious metal's allure seems to be declining as traders await a fresh catalyst amid the uncertainty over Spain's bailout. Spain is at the centre of the Eurozone debt crisis and investors are waiting for something to happen. Rumours are rife on a global level that more monetary easing measures will kick start the gold market after it reached highs of $1,783.3 earlier this year. Many investors are targeting the $1,800 level, hoping that the precious metal will become more attractive in the face of fiscal uncertainty and massive open-ended monetary expansion. Crude oil saw a timid advance during the first part of yesterday's trading session, but this was overturned late in the afternoon by profit taking on concerns over the global outlook. Spain is still delaying its bailout call and Australia seems to be worrying about demand for its commodities, so it is difficult for oil investors to remain bullish for too long. As a result, WTI crude oil prices dropped $0.52 to $91.89, with participants now awaiting extra clues from the release of the US weekly inventories report. Bargain hunters and a slightly weaker US dollar pushed gold prices higher yesterday, as the precious metal rose by $5.30 to $1,777.00. Commodity traders seem to think that the ongoing European sovereign debt crisis and a sluggish US economy are good enough reasons to support the precious metal for now. A positive reading of US factory activity kept energy investors optimistic that oil demand will remain supported. This allowed the US crude oil market to make a $0.33 gain for the day, closing at $92.48. However, the tight trading range also suggests that there is plenty of caution ahead of the crucially important events later in the week. Interest rate meetings from the Bank of England and the ECB, combined with the US Non-Farm Payrolls, are sure to keep us on our toes. Gold prices eased further on Friday, dropping $5.25 to $1,771.70, as the US dollar attracted safe haven buying. However, the precious metal performed better for the week than either crude oil or indices; testimony that the uncertainty in the markets is still offering good support. Nevertheless, from a technical analysis perspective, the trend has now turned sideways as the rally has lost steam. In line with the world spread trading markets, the energy sector saw the effects of the last round of monetary stimulus wearing off. At the same time, oil futures are starting to feel the downside pressure coming from signs of a weakening real economy. This was clearly visible during last week, despite Friday only seeing a modest drop of $0.16 to $92.19. It remains to be seen whether this week's interest rate decisions by the Bank of England and the ECB, combined with the US Non-Farm Payrolls, can change the bearish trend.